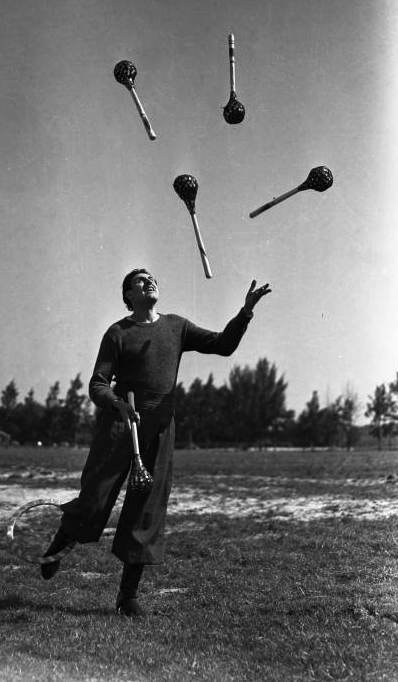 Ringling juggler Massimiliano Truzzi practices in 1941. A few years ago I stumbled on what is one of the coolest ways to think about exercise. Although adapted1 initially to describe how soccer players are the “ultimate well-rounded athletes,” (a claim that merits some debate to be sure) the “Eight Pillars of Fitness,” as described by Ashleigh Townsend, can apply to any serious athlete. Though Townsend argues that these attributes are already present in soccer players— or, ‘footballers’—shades of each of these components are present in almost every serious athlete. In hopes of bettering my own physical fitness, I’ve attempted to include these pillars in my workouts each week over the past year. Despite my best efforts and strict discipline, I’ve experienced mixed success due in large part to what I call the ‘give and take’ of fitness– the moment that I begin to focus on a single component of my fitness, the more I experience declines in other areas. I suspect that other athletes have also encountered this problem. It’s high time to change that. While my cardiovascular endurance and speed have no doubt increased (my resting heart beat was 48 bpm earlier this week and I ran five miles at a 7:04 average pace yesterday morning), my muscular strength as well as my flexibility have both deteriorated significantly. Running has long been known to greatly decrease one’s range of flexibility due to the repeated contraction of muscles in a somewhat rigid movement. Simply in reaching down to touch my toes, I feel far more tension than I’m used to and am completely unable to do the splits, not that I ever could anyway. To test the weakening of my muscular strength, I compared the weight that I have most recently been able to lift to my PRs as set at the end of my bulking phase in January. The results aren’t pretty. As is evident, in making gains in my muscular and cardiovascular endurance, I had to forsake a good amount of muscular strength (roughly 10% of it) possibly as a means of becoming more agile and lean. The exact opposite was true when I stopped running in November of last year and started bulking. As I focused more and more on building my muscular strength, my cardiovascular endurance suffered immensely. I would routinely get winded walking up a flight of stairs and was happy to scrape by with just barely running a nine-minute mile. The major takeaway here is that when one begins to focus intensely on one of the pillars, a different component will likely be neglected and begin to deteriorate. 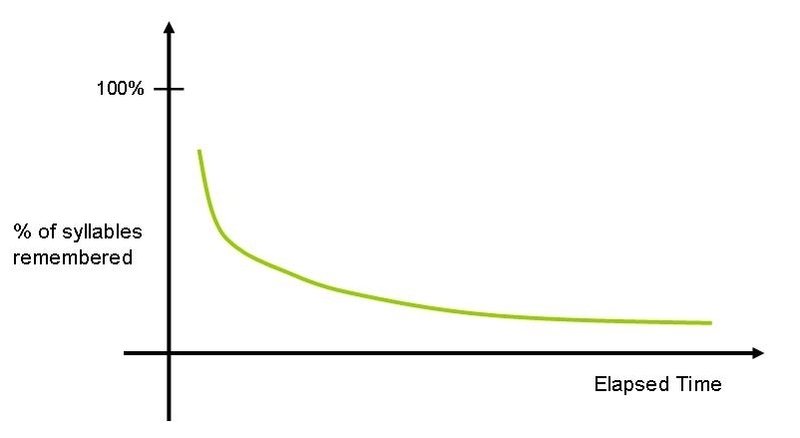 The decline is somewhat akin to the famed Ebbinghaus forgetting curve. In 1885, psychologist Hermann Ebbinghaus began memorizing nonsense syllables (e.g. CBV, UMQ) as a way of measuring the celerity at which he forgot them. His results are depicted on the curve above– although he forgot most of the syllables soon after he stopped reviewing them, he maintained a baseline knowledge, as seen in the leveling off of the curve, in the long run. Similarly in fitness, if one stops doing push-ups everyday (a movement that improves muscular strength and endurance) in order to run three or four miles (betters one’s cardiovascular endurance), one’s abilities may weaken dramatically and eventually reach a certain equilibrium. For instance, whereas Judy could once do 30 push-ups in a row, after four weeks of running and doing minimal strength training, she can now only manage 20 push-ups. The good news? Psychologists have found that with appropriately interspersed rehearsal, the brain can be trained to regain a similar level of memory that was present directly after the material was first learned. The effects of these rehearsals are seen on the curve to the left wherein regular reviews cause a spike in the percent of material remembered. Like the brain, I believe that the body can also adapt to return to a similar, though definitely not the same, level of fitness with the appropriate amount of focus on each of the different pillars. Ideally, running five to six times a week is best way to improve the strength of one’s heart and lungs. Something as simple as three one-mile runs, two two-mile runs, and a three-mile run each week is enough to start to build a stronger heart. For most, however, a half-hour run each morning is neither feasible nor enjoyable. 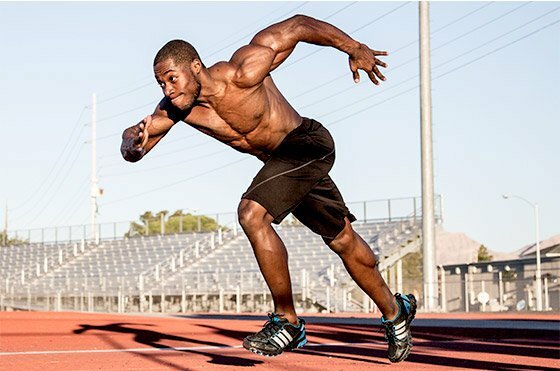 I instead recommend interval training, specifically high-intensity interval training, or HIIT. My favorite form of HIIT are tabatas (see a full explanation and list of my favorite tabata routines here). They are roughly twenty-minute workouts that focus on two to four body parts. Ideally, one would perform 45 minutes to an hour of weight-lifting with low volume (few repetitions) twice a week. For the time-strapped among us, doing weighted bodyweight exercises is a great way to build muscular strength. For instance, one could place old textbooks or phone books into a backpack and then proceed to do a series of weighted push-ups and pull-ups. Ideally, one would perform 45 minutes to an hour of weight-lifting with high volume (many repetitions) twice a week. Ideally, one would be able to do fartlek runs (Swedish for ‘speed play’) or another form of interval training for upwards of a 45 minutes about once or twice a week. Luckily HIIT also works to improve one’s speed depending on the movements that comprise the workout. Most exercises that work the entire body, such as burpees or squat jumps, will improve your speed. Although each of these components has its own pillar, I’m grouping them together because a consistent practice of yoga helps to work all of them. While most Westerners may picture yoga as being only a 90 or 60-minute practice, doing yoga for just 20 minutes is often sufficient to garner the full range of benefits that come from a more lengthy practice. I recommend practicing yoga at least twice weekly in order to maintain one’s balance, coordination, and flexibility. One of the best practices I’ve found is a YouTube video entitled, “Yoga for Complete Beginners”. The link is here. Just by searching ’20 minute yoga’ you can find several other videos that walk you through the basic poses in vinyasa yoga. Thursday: (weighted) bodyweight training– note that not all fitness levels should use extra weight. In most cases, one’s own body weight is sufficient for a great workout. With a fitness structure similar to the schedule above, both athletes and amateurs alike can maintain great overall fitness, taking into account each of the pillars! 1. The first instance I found in which fitness was broken up into components was in a 2003 post on the CrossFit website, which can be found here. Seem to be some glitches – links don’t ‘click’.